The preliminary findings of a multi-year study across the state of Alabama seem to indicate that chess instruction may improve student performance, especially amongst younger students. 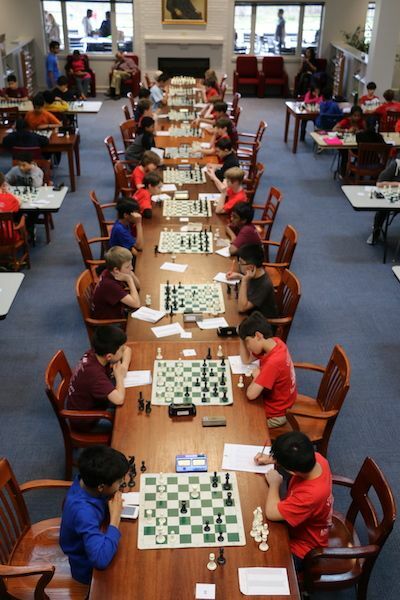 The study, conducted by researchers at Tennessee Tech and the University of Alabama and in conjunction with the Alabama Chess in Schools, released its findings last month. While numerous research studies have been conducted with chess and children, this is the first rigorous longitudinal study in the U.S. in some time. The research indicated much less of a corresponding effect of chess and reasoning in middle school years, but does seem to show more of a positive correlation than other recent studies that Chess.com has reported on. Full disclosure: ChessKid.com, the scholastic extension of Chess.com, was used by the program’s leaders and teachers and the data derived was incorporated into the study, although neither Chess.com nor ChessKid.com staff contributed in any way to the actual research or the writing of the report. The report concluded that 79 percent of the teachers involved in the study used ChessKid.com in some capacity. A group of kids from Alabama get a personal ChessKid lesson from FunMasterMike. Photo: Christine Vancott, ChessKid.com. The research only focused on years 1-3 of what will eventually become a five-year project. 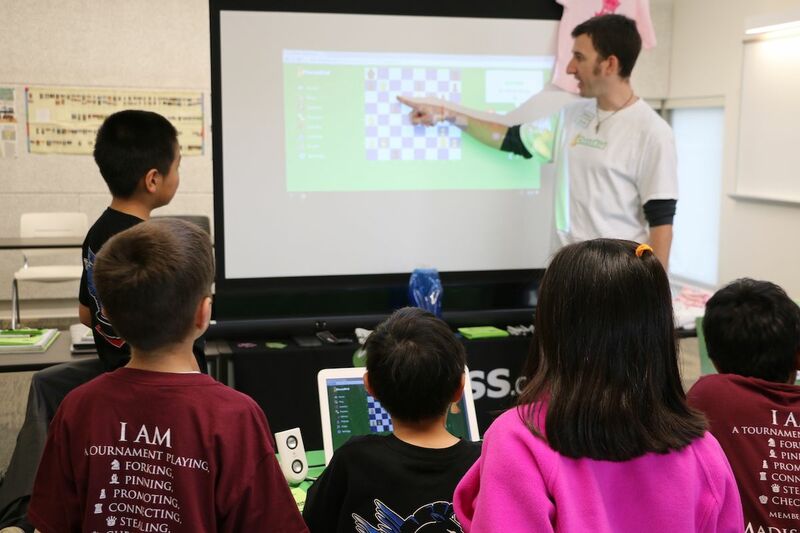 Most of the data comes from the first two years, where nearly 800 kids were taught chess for a minimum of 1-2 hours weekly (more than 90 percent of classroom teachers reported using ChessKid.com in their instruction). In addition, about 400 kids were in a control group and were not given chess instruction. The study goes on to show data in a variety of areas, including critical thinking, a “21st Century Skills” evaluation, a teacher survey, and a student survey. 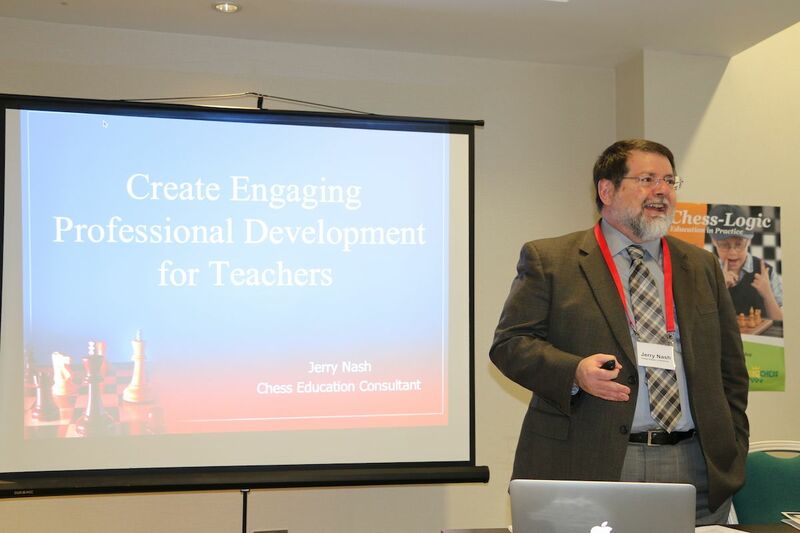 Jerry Nash, a lead consultant on the study who helped train classroom teachers on how to teach chess. Photo: Mike Klein. 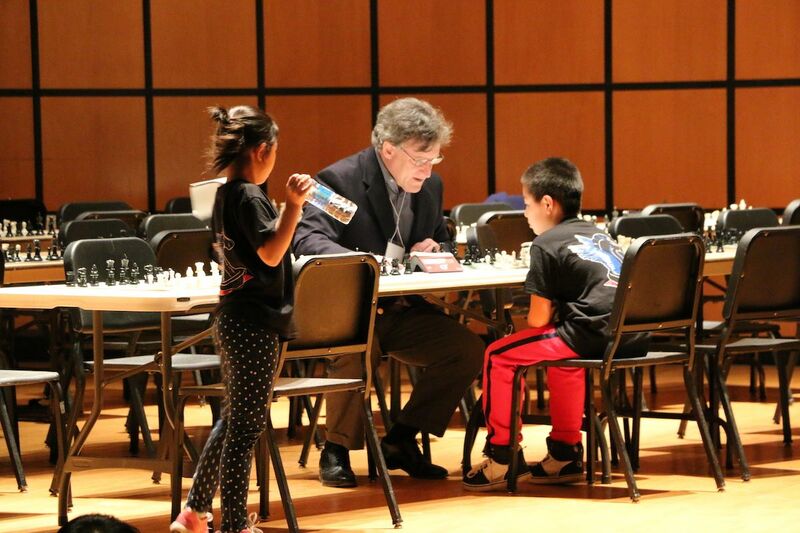 Neil Deitsch, managing director of Alabama Chess in Schools, helps out some local kids. Photo: Christine Vancott, ChessKid.com. The so-called “Cornell Critical Thinking Test” was given to both the chess and control groups at the beginning and end of the year. The test measures five areas: induction, observation, credibility, deduction, and assumptions. Year one was much more positive for fans of chess education. 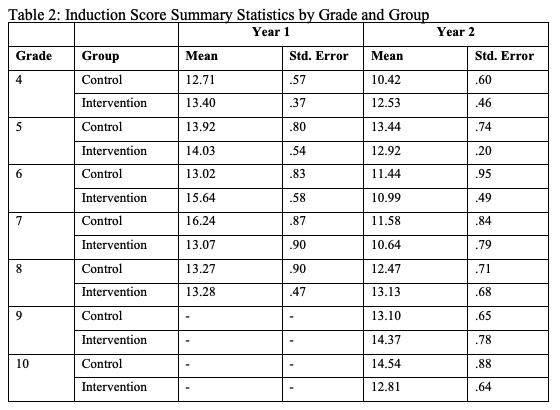 Of the five grades for which there is data, all but one showed better scores for the chess (intervention) group for “induction.” Year two was more mixed, but again the youngest grade (4) showed better scores, as did grades 8 and 9. For observation and credibility, chess gave more of a clear bump to younger children. Grades 4-6 chess students did better in both of the first two years of the study, while only in the second year of the study did the eldest students perform better after chess education. 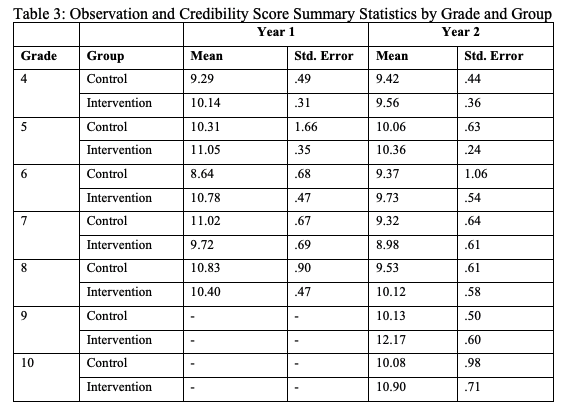 Those same findings closely parallel how students performed in the deductive reasoning section and also the assumptions section. Overall, clearly the youngest kids in the study in grades 4-6 showed the most to gain from chess education. 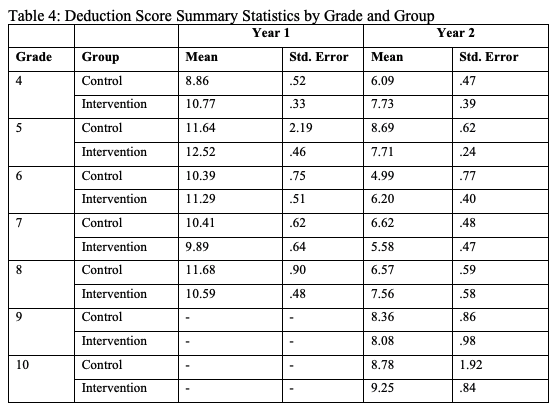 This was again seen when testing for “deduction” as the noticeable gains in the elementary school years mostly tapered off by middle school, but then reappeared in 10th grade. For the “21st Century Skills” measurement, when comparisons with a control group were possible, the study reported that “students exposed to chess were, on average, consistently rated by their teachers as having made improvements.” The skills being measured by teachers via a pre-test and post-test were: academic achievement, effective decision and judgement processes, critical thinking, strategic thinking, problem solving, systems thinking, cross-disciplinary thinking, and overall engagement. Numerous more charts for this octet of constructs is available in the full report. A group of kids compete in the 2016 Alabama State Scholastic Championship. Photo: Christine Vancott, ChessKid.com. 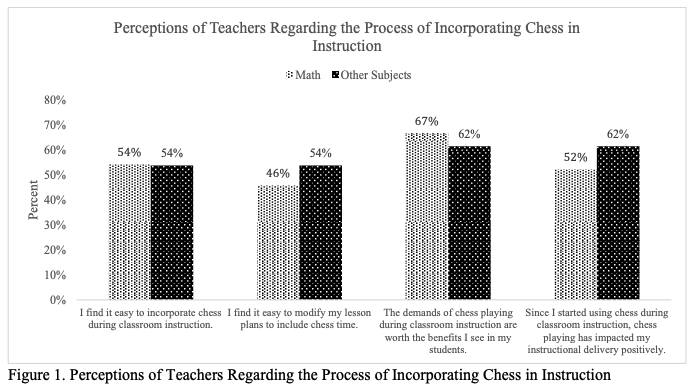 Other figures bolstering the argument for chess education: 81 percent of teachers thought chess helped their students socially and 73 percent thought the game helped academically. 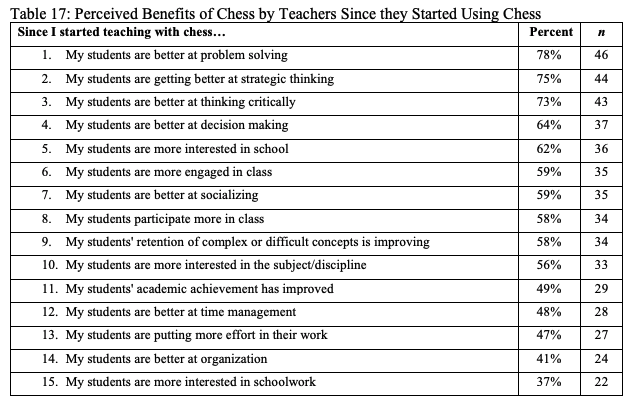 Chess suffers from a labor shortage, but importantly more than seven out of 10 teachers said they enjoyed mixing their teaching with chess.